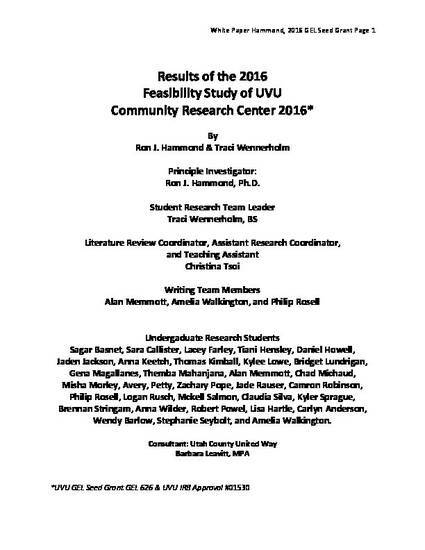 This feasibility study undertook a broad research plan in an effort to evaluate the feasibility of UVU establishing a community agency research support center in the near future. The research project involved 33 student researchers, a paid research supervisor, a volunteer teaching and research assistant, and one UVU faculty member. Feedback from the 71 community agencies surveyed indicated that there are already tens of thousands of disadvantaged community members/clients being served by nonprofit agencies in UVU’s service area. These agencies operate independent of government and are primarily funded by donations, grants, and other non-governmental departments. Six out of ten of these agencies need some form of help that UVU might be able to provide. UVU Students reported many benefits form having participated in this feasibility study. All these findings support the consideration of a UVU Community Research Center.